Avoid the more well-trodden pentatonic paths by picking up some of these licks. Grab your guitar and learn a few of Eddie's signature licks. Four easy solos that every beginner should learn. It’s easy to make mistakes while learning guitar, and develop bad habits without even realizing it. Unleash the fury with these “shredtastic” ideas. Learn these licks and put them to use in your own lead guitar work. If you're tired of playing the same old Led Zeppelin riffs (and who isn't? ), you're in luck. Five different ideas on how to conquer sweep picking and how to incorporate it into your own playing right away. Everyone has a riff, or three, that they think deserves more praise from the guitar community. If you're tired of playing the same old AC/DCriffs (and who isn't? ), you're in luck. There’s a fine line between being influenced and outright stealing. 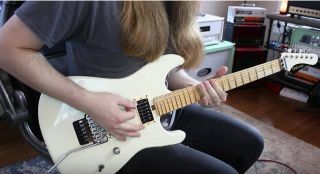 Can You Name These Five Riffs By Hearing Just One Note? Can you tell what a riff is by hearing just the first note?